The engine will understand what you're up to based on your past queries. It's been twenty years since Google launched its search engine, and today it's hard to imagine a world without it. At an event in San Francisco today, the company announced new features to Search that would change the way we use the internet in the decades to come. The next chapter of search, according to the company, will be powered by AI, and starts with a new "activity card" and collections of results. It will use information from your previous searches to show you what you've already found, and surface relevant data for activities it looks like you're about to start. When you're searching for "camping," for example, a tab appears above all your results to show you your recent findings. Scroll down the page, and you'll see listings organized into categories like "sleeping bags" or "campsites." You'll be able to create your own collections, and Google will suggest you make them based on what you've found, too. The idea is that Google will know what you've been planning and the pages you've already seen, so you won't have to repeat the tedious job of making sense of the entire internet all over again. It'll also show you search terms that you've used before. 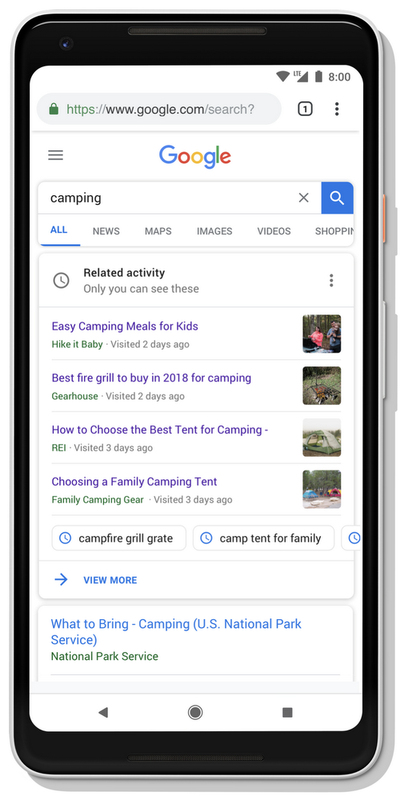 Google will also recommend content you haven't seen that might be useful, like camping checklists or tips. When you're looking up a new topic, the search engine will also organize the results in tabs that will change depending on the subject. If you're finding out about "pugs," for instance, it will display tabs like "Buy or Adopt," "Names" and "How to Train." But for a different breed, like "Yorkshire Terrier," you'll see different headers like "Characteristics," "How to groom" and "History." In short, your Google search results are about to look quite different. You might get the sense that the company knows more about you than before, especially what your queries have told it you're about to get up to. Hopefully, that will make you feel like Google is being more helpful, rather than more creepy.